The 12th edition of India's cash-rich star-studded Twenty20 cricket tournament, Indian Premier League (IPL) aka VIVO IPL 2019 will kick off on March 23, Saturday. Unlike the previous years, the Board of Control for Cricket in India's (BCCI) Committee of Administrators (CoA) decided to scrap the opening ceremony of IPL 2019 as a mark of respect for the slain Pulwama CRPF soldiers. The money allocated for the event would now be donated to the kin of the martyrs. The opening ceremonies of the cash-rich league have divided opinions since its inception with many calling it unnecessary. With no ceremony this year the board has most likely avoided any kind of controversy that may have erupted. Money in excess of five crores is expected to be handed out the family members of the CRPF jawans. Let us look back at some of the highlights of the opening ceremonies over the years. IPL 2019 Schedule in PDF: Download VIVO Indian Premier League 12 Full Timetable With Fixtures, Matches, Team and Venue Details. 2017 IPL Opening Ceremony in 8 Cities: The 10th edition of the Indian Premier League started with glamorous ceremonies being conducted in Delhi, Mumbai, Indore, Kolkata, Hyderabad, Pune, Bengaluru, and Rajkot. The entire brigade of Bollywood including the likes of Disha Patani, Tiger Shroff, Kriti Sanon, Pareeneti Chopra, Amy Jackson, and Shraddha Kapoor were part of the event. The fab five of Indian cricket – Sachin Tendulkar, Saurav Ganguly, Rahul Dravid, VVS Laxman, and Virender Sehwag were also felicitated to make it memorable. 2013 IPL Opening Ceremony- Pitbull performs in Kolkata: American rapper Pitbull who has quite a huge fan following in India performed before a capacity crowd in Eden Garden, Kolkata. He set the stage on fire with several of his hit numbers and was later joined by Shah Rukh Khan, Deepika Padukone and Katrina Kaif. The multiple award-winning artist was the main attraction of the opening ceremony and received a lot of media attention. IPL 2019 Foreign Players: From AB de Villers to Sandeep Lamichhane Team-Wise Overseas Players to Watch Out For This Season. 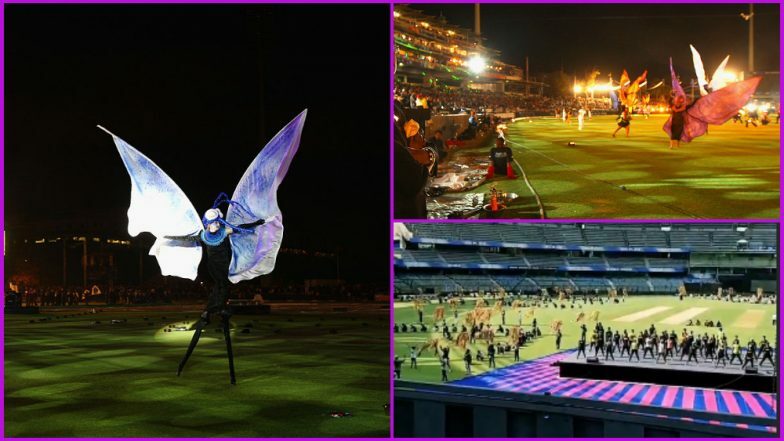 2010 IPL Opening Ceremony- Laser Show: Back in 2010 at the DY Patil stadium in Navi Mumbai, an enormous laser show was part of a start-studded occasion. A multi-coloured laser show was on display for the fans who were mesmerised by the beam of LEDs and laser. This act by a laser artiste was different from the regular Bollywood performances and hence made it memorable. 2009 IPL Opening Ceremony in South Africa: Due to the security issues, the 2009 IPL was shifted to South Africa and what a huge hit it was even though it was outside India. In the opening ceremony held in New Lands, Cape Town Local Zulu Dancers were on show in addition to the local Djembe drummers who stole the show. Renowned band Snow Patrol also was invited to perform as the organisers decided to take the event to a more international level. IPL 2018 Winner: Here’s a Quick Look Back How CSK Won Last Year’s Indian Premier League. 2012 IPL Opening Ceremony- Priyanka Chopra steals the show: The 2012 IPL opening ceremony was all about Priyanka Chopra as the Bollywood actress enthralled the audience with her power pack performance. She made Harbhajan Singh dance as part of a small gig and also interacted with cricketers like Mahendra Singh Dhoni. Her opening act on the popular song “Aaj Ki Raat” sent the fans in frenzy. These were some of the most famous performances over the multiple seasons of the Indian Premier League and though several fans will miss it, they know it is being skipped for a good cause.